As single-culture festivals go, the Thai New Year Songkran this past Sunday was as perfect as they get. If you missed it this year, you might want to put it on your calendar for next year. It is worth going out to the Yanviriya Temple near Yonge and Major Mackenzie in Richmond Hill. It was like being in Thailand except for the chairs. Most people sat on mats on the floor. Those of us who arrived early, especially the foreigners, grabbed the chairs along two of the walls. Five Thai monks presided at the front of the hall under the statues of the Buddha. They chanted prayers while bound by a cord to each other and thus to the rest of us, a young Thai woman cheerfully explained. It was a nice mix of Thai people and farangs, us foreigners who were about ten percent of the 100 or so people there. Everyone answered my questions readily and cheerfully. A monk told me that the Yanviriya had two monks of its own. The others were from out of town. The prayers at the beginning were relatively short. Some Buddhist monks in other cultures go on for hours at occasions like this. These were just the right length for people who did not understand. Candles were lit. People kept arriving, carrying food. They brought packages of new robes for the monks, incense, tooth brushes and paste, everything a monk might need. Each newcomer attached cash to a money tree – I noticed several $100 bills. It was for luck in the new year as well as a donation to the temple. A woman in Thai dress made announcements in Thai. I caught a couple words like “Edmonton” and “City Hall.” The Thais near me were willing to translate. When the prayers were over, all the food was placed on a central table. 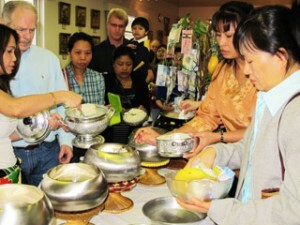 Some of the cooked rice was ladled into huge silver bowls. Volunteers took away the rest so there would be room for more. It was all well organized. Next thing I knew, all the food had disappeared. Nicole from Guyana explained that it was now downstairs. She was taking meditation classes there and had attended the festival the year before. Then I looked at the monks again. The volunteers had brought each of them a huge tray full of food and they were starting to eat. I went downstairs. Much of the donated food was now spread over a huge table. It was fantastic. Most of it was home-made of course, and so much better than that in many of Toronto’s Thai restaurants. 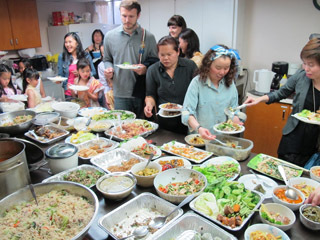 Some people had brought Tim Horten’s donuts, but most of the food was genuine Thai – some amazing dishes. I asked if anyone knew a Toronto restaurant where we could find real Thai food like this. A woman said the owner of the Royal Elephant at 1100 Eglinton West was present. He gave us his card. It read “Thai Fusion” but I’m going to give it a try anyway. Lunch over, I went back upstairs to find people lined up to pour water over one of the statues of Buddha. Water-splashing in Thailand, where everybody gets wet, is part of this festival, but the Thais said Toronto was too cold for that. I did as I was told. It was all free, but after I got home, I sent the temple a donation.